Click the button below to add the 1964-1967 Chevy El Camino 3 Row Radiator + Fan Shroud to your wish list. This is our 1962 Chevy Impala, we just purchased your radiator last year and we are very happy with it. We live in Florida year round. And the car runs cool even during the hot summer months. Temp runs at 175 and comfortable. 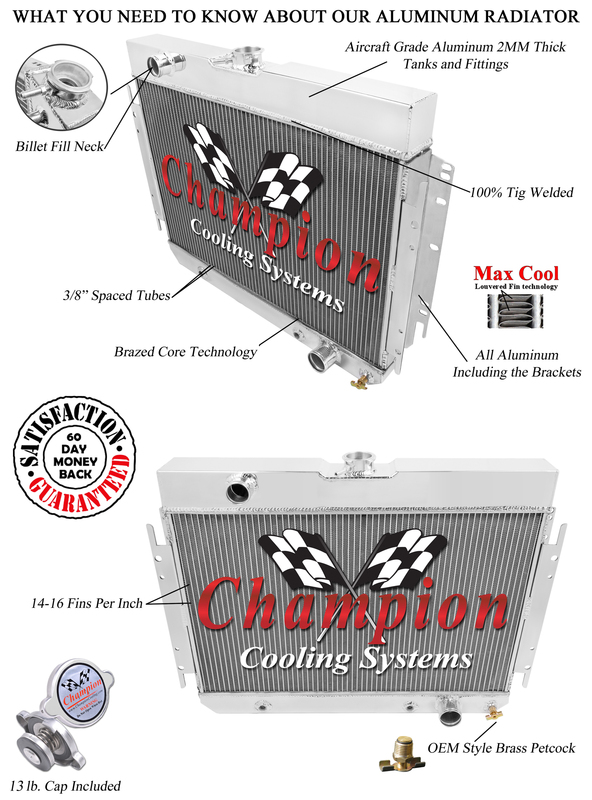 I purchased a 3-row aluminum radiator made by your manufacture, Champion Cooling for my 1959 Chevrolet Impala Sport Coupe. The engine in the Impala is a chevy 350 with aprox. 300 hp. cools very well and looks awesome!!!!!! I recommended them to friends of mine, and one of them already bought one. I have a 1962 chevy impala with a 327ci engine. I am currently restoring it to be something like a lowrod. I guess I watched to much overhauling andI liked the chip foose style (I wish chip would have done my car). It is currently about 70 percent complete. Unfortunately I have not road tested any of the components. I purchased the three row aluminum radiator and it mounted in perfectly, but Ill have to take it off because I forgot to mount the electric fans .here are some pics. Plus 2800 CFM Fan Shroud Made In The U.S.A.For 1963-68 Chevy ModelsCapriceChevelleBel AirBiscayneEl CaminoImpala / SSSee Vehicle Compatibility Tab! Will Cool Up To 850hp...Guaranteed! You will not find a better guarantee anywhere on eBay! Overall Diemesions: 21 1/4" high x 27 3/4" wide (including brackets). Upper inlet: 1 1/2" located on driver side. Champion Fan Shroud w/Dual 12" Fans made in the U.S.A. Call to pay securely with any major credit card!